December 15, 2018 Robert W.
Vegas foam board sign printers can get you that needed foam board sign printed quickly and inexpensively. Foam board signs are very popular at tradeshows and conventions, but also for point of purchase sales at grocery stores and local convenience stores. Foam board signs are popular because they are very lightweight, inexpensive and can be made quickly. These foam board signs are made for indoor use as the weather will warp them. Coroplast plastic signs are made for outdoor use and are much more rugged. Vegas foam board sign printers define foam board as a foam middle with a paper on the outside that allows it to be printed on. Many photographers will use foam boards as a way to display their pictures at an event. The trade shows and conventions use foam boards to direct people to the proper location and help explain the event. The vendors at the trade shows and conventions will use foam board to display products and services they are introducing their client to. Vegas foam board printers keep busy during the trade show and convention season because foam boards are generally not shipped because they are fragile and will easily bend. These throw away signs are inexpensive and shipping alone will sometimes exceed the value of the sign, consequently, many vendor will just simply have their Vegas foam board printers print up their signs and pick them up on the way to the event. Not only does this save on shipping fees. it also saves on the exorbitant fees to store the signage that some places charge until you pick up your packages. Vegas foam board sign printers print on 3/16ths foam board for around five dollars a square foot and around nine dollars a square foot for 1/2″ thick foam boards with a laminate on top of the print to protect it. November 11, 2018 Robert W.
Foam core board 48″ x 96″ Signs in Las Vegas are used at the many hotels and casinos in Las Vegas for indoor advertising. Foam core board 48″ x 96″ signs are made up of a foam that has a paper pressed onto both sides that allows it to accept print. The two normal sizes for these boards are 3/16ths inch thick and 1/2 inch thick, but they do make other thicknesses as well. The sports book at many casinos use these lightweight foam boards to display advertising of events and food specials. Foam core board 48″ x 96″ signs can be hung from ceilings, be self standing or be attached to walls. They are very versatile for displaying because they are lightweight and if they are hung from the ceiling or fall down for some reason, they will not hurt anybody because they are made of foam. Sometimes at the sports book or other places in the casino, they will make a one inch double sided foam core board sign and then simply make it a self standing unit that looks very impressive since it is 4ft wide by 8 feet tall. You can place a actual size picture of a casino person on the sign as a way to advertise. Foam core board 48″ x 96″ signs are full color and can be printed with any color or combination of colors you like. They can also be printed with pictures and logos as well. Typically, they are laminated after printing to protect the print and allow for a shiny finish that is impressive. Smaller sized foam core board signs can be used at meetings and presentations where there is not a lot of room. These foam boards are made for indoor use as if you were to use them outside, the weather would warp them quickly because of moisture or hot weather. November 10, 2018 Robert W.
Foam board 36 x 48 signs are being used at the trade show and convention venues for display of products and services. Foam board 36 x 48 signs are 3ft x 4ft foam core signs that have a vinyl print applied to a 3/36 “ or 1/2 ” foam core board and then laminated to protect to the print. Foam boards are made of foam with a outer paper layer that allows for a print. They are lightweight and considered a indoor sign and for temporary usage. If used outdoors, they will warp in weather rather quickly. Vendors use these foam core boards at these venues as well as the hotels and casinos along the Las Vegas Strip. It seems each casino along the famous Las Vegas strip has meeting rooms that are several thousand feet in space that can be divided up and in these meting rooms, these foam board 36 x 48 signs can be seen along with other forms of signage. A couple of banner stands, a custom printed table cloth and some foam boards and you instantly have a booth display that looks very impressive at a low cost. Foam board 36 x 48 signs are usually printed in Las Vegas by the many sign stores that cater to the events and shows held locally. These foam boards are delicate ( because they are made with foam) and can be damaged easily which is why they tend to get damaged in the shipping process. By having the foam core boards printed locally, vendors know that they will be in excellent shape and ready to present at your event. Contact a local sign shop like www.Posterhead.com if you find yourself wanting foam core board signs. November 9, 2018 Robert W.
Foam board 22 x 28 sign printing in Las Vegas is available at sign shops that service the event and show industry. Not only are foam core board signs used at trade shows and conventions, they are extremely popular at gas station and quickie marts where point of purchase advertising is very popular. These lightweight, sharp looking signs are the favorites at quickie marts because they can be hung from the ceiling and placed just about anywhere and advertise impulse purchasing of products at check out counters. Foam board 22 x 28 sign printing is especially popular at meeting and events where image is everything. These foam board signs look great printed with a laminate on them . They are very professional looking, lightweight and inexpensive. Foam boards are referred to as temporary signage because are used for indoor purposes and usually do not last long because they have a tendency to warp. For indoor and outdoor signs, coroplast signs are used which allows for a longer lasting sign that is made with plastic, but does not look as nice. These signs are also displayed at trade shows and conventions where they are placed on easels or tables and printed with advertising or company information. Foam board 22 x 28 sign printing is especially popular in Las Vegas because these signs are made with foam board and subject to being damaged easily. 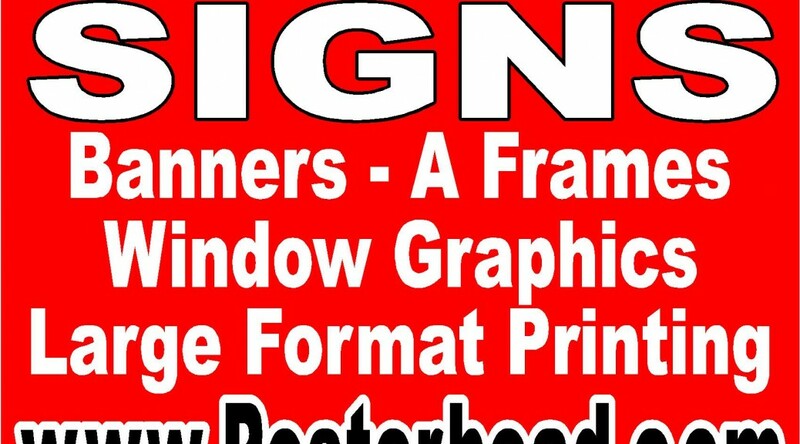 By printing and making these signs in Las Vegas, they avoid shipping which is cause for a lot of damage to trade show and convention display signs. In fact, many vendors and businesses that come often to Las Vegas prefer to have there signs and banners made locally to avoid the high cost of shipping. Knowing that the signs are ready and at the proper location makes people worry less. Contact a local sign store today if you should find yourself in need of foam board 22 x 28 sign printing. November 5, 2018 Robert W.
Foam board 24 x 36 printing cheap can get you that foam board cheap ! These foam boards are printed on 3/16th and laminated for $30.00 !! Las Vegas is home to many trade shows and conventions and these 3/16ths foam boards are very popular at these events. Hundreds of shows and events happen annually in Las Vegas and that means that thousands of foam board signs are produced for these events and the sign stores in Las Vegas make them cheap and with quality, using the latest in large format printers capable of printing fantastic designs. In fact, the sign is printed on a vinyl and then laminated with a gloss or matte finish and then applied to the foam board. The foam board itself is usually one of two different sizes, the 3/16ths or 1/2″ size. The foam boards themselves can be printed in a multitude of sizes to accommodate your graphic needs. Foam board 24 x 36 printing is great for those meetings and displays at events and shows. The foam board sign is used mainly indoors as it is temperamental in the outdoor weather and if it gets wet, will warp. Coroplast signs which is made out of plastic is the choice material for signs being used outdoors as coroplast is made with a plastic that is weather resistant. Foam Board 24 x 36 printing is just part of the signage that could possibly be needed at event and show venues. banner stands play a large role in graphics as they seem to be very popular at these venues . Like the foam board signs, the banner stand can be moved around your display booth to fit in your display. These banner stands are self standing and require no additional support. Contact a local sign company in Las Vegas to see how foam boards in the popular 24″ x 36″ and 20″ x 30″ sizes can help your display. July 14, 2016 Robert W.
Las Vegas foam poster boards are popular at business presentations and conventions. These temporary professional looking signs are made with foam core boards that are intended for indoor use. Foam core boards are highly vulnerable to weather conditions, especially water. For outside signs that are disposable, coroplast signs are made for exterior use. Las Vegas 89101 foam poster boards are not very expensive. A 3/16″ thick foam core board sign sells for about $4.00 a square foot and the thicker 1/2′ thick foam core board sells for around $6.00 a square foot in Las Vegas. They are laminated for a professional look. Businessman use these foam poster signs for business presentations and high schools use these types of signs for proms and school functions. I have also seen these foam poster signs at ” Quinceanera” and Bar Mitzvahs. They usually place a picture of the person who the party is for and also the date of the party. Las Vegas 89101 foam poster boards are also very popular at the conventions and trade shows in Las Vegas. Las Vegas is a very popular place to hold conventions and many foam core board signs are used at conventions. Since these foam board signs are fragile ( they are made with foam board ) many times the people that are presenting at conventions and trade shows will have the foam board signs made in Las Vegas so that they cannot be damaged while being shipped to Las Vegas. The cost of protecting the poster board signs in wrapping and shipping sometimes will exceed the cost of making the foam board signs. Consequently, it is cheaper to have the foam board signs made in Las Vegas rather than having them shipped in from elsewhere. Las Vegas 89101 foam poster boards can be purchased at many of the finer sign shops located in Las Vegas. June 23, 2016 Robert W.
Las Vegas 89109 foam core board signs are very popular at Las Vegas conventions and trade shows. Mainly because many times the foam core board signs will get damaged while being shipped to Las Vegas since they are very fragile and not designed to last a long time. Many sign shops in the area make Las Vegas 89109 foam core board signs for such a reason. Las Vegas is a great location to have trader shows and conventions. There is always things to do in Vegas besides the gambling and night life. Las Vegas has many fine dining restaurants, world class entertainment and luxury accommodations for those that like to be spoiled. While everybody always thinks of Las Vegas as a gambling mecca, there is definitely much more to Las Vegas than just wagering. Consequently, many people decide to hold their conventions and trade shows in Las Vegas and every year, more and more people come for their trade shows. Las Vegas 89109 foam core board signs are not expensive. The average cost of a foam core board sign with 3/16 foam board is around $4.00 a square foot. The 1/2″ board goes for around $6.00 a square foot. These foam core board signs are full color, meaning you can have as many colors and pictures on the foam core board as you want. There are many sign shops in Las Vegas that can assist you with the design if need be at a reasonable cost as well. These signs can be made quickly in case you decide to travel with foam core board signs and they become damaged in travel. Contact a local sign shop in Las Vegas to assist you in making your foam core board signs and take advantage of the low cost and professional service that Las Vegas sign shops have to offer. April 4, 2016 Robert W.
Las Vegas 24 x 36 foam core board prints are very popular at business presentations, school ceremonies, Las Vegas trade shows and conventions. They are even more popular at convenience stores when you pay at the cashier for your products. Trade shows and conventions love Las Vegas 24 x 36 foam core board prints because they are so inexpensive and professional looking. Foam core board prints are designed for indoor use and will become damaged when being transported . Consequently, many times people who are working the trader shows and conventions in Las Vegas will have their Las Vegas 24 x 36 foam core prints made by a local sign shop to prevent the possibility of being damaged in transit to the show. Las Vegas area schools like the foam core board prints because they are professional looking and will use them at presentations and ceremonies. Many times you will see this type of signage at the entrance to a prom, dance or other school social event as well. Las Vegas 24 x 36 foam core board prints are extremely popular at convenience stores in Las Vegas. These foam core boards make for lightweight and professional looking signs that can be made inexpensively to promote goods and services that the convenience store offers. Many manufacturers like Gatorade, Coke, Pepsi, and other producers will jostle over advertising displays at the check out counters in order to facilitate last minute impulse purchases. Many people will buy last second items while standing at the cashier making their intended purchase. Advertising at the cashier register brings high dollar profits for those companies that have advertising at that premium location. Las Vegas 24 x 36 foam core board prints can be found at many of the sign and print shops in the Las Vegas area at very reasonable prices. Contact a sign shop today to see how these foam core boards can help your business. March 28, 2016 Robert W.
Las Vegas 3/16 foam core boards are very popular at Las Vegas conventions and trade shows. Las Vegas 3/16 foam core boards also are used at special events and at professional presentations. Since Las Vegas is the number one destination for trade shows and conventions, many foam core board signs are made right here in Las Vegas. Foam core signs damage easily which is why the majority of the foam core board signs are made right here in Las Vegas. Las Vegas 3/16 foam core boards are made for inside display and will be damaged when exposed to water and different weather conditions. For exterior use, coroplast signage is what the alternative is. Usually, foam core boards are printed directly on or applied with a vinyl application with a laminate on top to make them very glossy and professional looking.These foam core boards are full color, meaning you can have pictures, logos and other graphics printed on them and they will produce bright and vivid colors. Las Vegas 3/16 foam core boards are used quite extensively at trade shows and conventions because they can be used one time and then simply discarded because they are so inexpensive. The trade shows and conventions will use them as props as companies show off their products and services to the people attending the conventions. At special events like proms or graduations, foam core boards are used to display the specific occasion. Business presentations or at business meetings, foam core boards are used to emphasize the presentation with charts, graphs and other important information. Las Vegas 3/16 foam core boards can be found at sign shops throughout the Las Vegas area for about $4.00 a square foot ( full color-laminated and printed on 3/16 foam core board) Large format printers and laminators are able to do most of the work at a very brisk pace which allows for a inexpensive project to be completed. January 11, 2016 Robert W.
Las Vegas foam core board signs are being used at special events and conventions all over the Las Vegas valley. These Las Vegas foam core board signs are very popular, economical and show really well at events. What are Las Vegas Foam Core Board Signs ? They are defined as “ are made of biodegradable, paper-faced foam board “. They are printed directly on or applied with a vinyl print and many times they are laminated to give them a shiny finish. The most common size for foam core board is the 3/16 thick foam board. 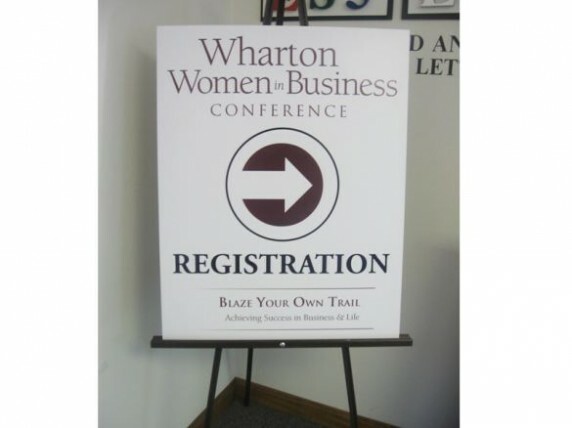 Foam core board signs are usually a one time sign that is disposed of after an event. However, they can be saved if stored properly. They are mainly used for indoor events, as water and other types of moisture have a tendency to cause damage to the foam boards. People generally display them on easels, but you can easily hang them with rope or tape them to walls and other objects since they are very lightweight. If used over and over again, simply wipe down the sign with a soft, non abrasive cloth and store in a dry place, making sure the sign is straight. Since Las Vegas is a major destination for trade shows and conventions, many foam core board signs are made here in Las Vegas. Many sign facilities are able to produce foam core board signs at a discount price because of the volume of work that goes through the signs shops during convention season. Las Vegas is the number one destination for trade shows and conventions in the United States. More people have their trade shows , conventions and exhibits here than any other place. Las Vegas foam core board signs can be purchased at local sign shops in Las Vegas. it is not recommended to have them purchased online because of the hazards of shipping these signs and possible damage because of their frailty.